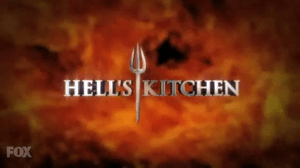 Hell’s Kitchen Coverage: To Be Continued? It is almost time for the “Hell’s Kitchen” chefs to get black jackets. The pressure is even greater in this episode due to a fabulous prize and some “Hell’s Kitchen” winners in the dining room. At the start, the Chefs were told that there were cars waiting for them. They were brought to “Bristol Farms Market” where their challenge was to be held. That challenge was the profit margin challenge. The challenge calls for each team receiving $35 to buy enough ingredients to make three entrees. They would then cook the entrees and each entrée would be given a monetary value by the day’s guest judges. The team with the highest amount won. The Red team went with Chilean sea bass, pork tenderloin and top sirloin while the Blue went with trout, lamb and a Cornish hen. Why would anyone buy Chilean sea bass on a budget and why would you make a Cornish hen under a short time limit? At least both teams came within a few cents under budget. The chefs came across two problems while cooking. These were the Cornish hen almost didn’t get fully cooked and Joy felt her tenderloin came out undercooked at the last second. Also, why did the Blue team tie up the hen and cooked it in the oven? It would’ve been easier and less time consuming to quarter and grill it. Of course, it came out raw at the last minute and they had to sear it. Joy broke down because she was really upset about her pork. At this point in the contest, she should have better time management skills. The guest judges for this challenge were food journalist Krista Simmons, “master yelper” Anita Lau and the Director of Development for “Innovative Dining Group” Brent Berkowitz. Jason’s hen got good remarks, but he only gave the judges half a hen. That cost him a high value and only getting an average $20 dollars. It came down to Red with a $48.34 hen and Blue $69.33 hen when Joy went up. She was so worried about her, dish but it netted an average $24.67 giving the Red the win with $73.01. The Blue team got the worst recurring punishment in “Hell’s Kitchen”- cleaning the dorms. As usual, the dorms were disgusting. Rochelle even threw up while cleaning a toilet. Why is it that every chef that appears on this show is a slob? The next day the chefs were exhausted. They were complaining and everything. When they went downstairs they were greeted by a crowd and photographers snapping their cameras. This media event like staging was complete with Ramsay behind a podium. This whole pomp and circumstance was for Ramsay to announce the first ever “Hell’s Kitchen” calendar. This calendar will have one recipe from each of the “Hell’s Kitchen” winners. The biggest surprise was the day’s challenge was for each chef to create a unique dish and the winning dish will appear in December of the calendar. That person would also win a black jacket. Also, helping to judge the dishes were “Hell’s Kitchen” winners Rock, Paul and “Hell’s Kitchen 10” runner-up Dana. It should be noted that Kashia has a fan girl level crush on Rock. She was even crying when he came out. Looks like a lot of “Hell’s Kitchen” fan’s wallets will be lighter due to the calendar coming out. Also, the idea of these chefs getting black jackets is scary. If they’re this bad this far into the contest imagine what the black jacket episodes will be like. Rochelle and Joy are the only ones worthy of a black jacket. These final episodes will be really interesting.